Printing from your application can be a very useful tool in a situation where you need to give a receipt to your customer direct from your Pocket PC. The ideal solution is to use an IrDA enabled printer with the IrDA port on your device. The Sapphire IrDA Utility allows you to print to such a printer right within your application. You can download the latest demo version to see a fully working demo which you can reuse within your application as you see fit. This can be found on the download pages. The demo versions are fully functional and simply contain a popup message from time to time. These are ideal if you are selling your application to the client where you can be confident the application will work in practice and not just theory. Implementation couldn’t be easier, simply declare the DLL function as a function within your application and call it as though you wrote it yourself. Here’s a sample demo on how to connect to a printer and print a string of text within VB.NET. 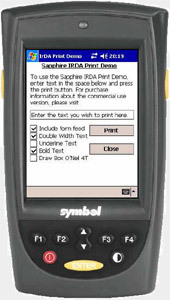 sLine = "Test print using the SapphireIRDA DLL"
When you purchase a developer’s licence, you are free to use the DLL in any number of your projects and deploy it to all the devices to your clients. There’s no need for royalties based on the scale of your project, just a one off fee. You will also get 12 months email support and discounted upgrades for future developments. Developer's Licence cost 399 GBP.